BALTIMORE — A year after the trial and nearly two years after the dramatic arrests, the seventh member of the deeply corrupt Gun Trace Task Force unit of the Baltimore Police Department stood before Judge Catherine Blake for his sentence; 10 years. "I am not surprised,” Gondo’s attorney Warren Brown said, “I think it was a fair sentence. The extent of his cooperation obviously benefited him. It also benefited him that cooperation was in part testifying in three trials that occurred in front of this very judge, the sentencing judge, Judge Blake." Gondo faced much more. The former detective's thorough cooperation and his damning testimony in open court helped land him on the lighter side of these corruption sentences. Brown says Gondo was one of the first to start talking to the feds after their arrest and has been quite a resource for an investigation he thinks is far from over. "I don't think it is done yet,” Brown said, “Not at all. I think that there continues to be investigations going on." For its part, the government won't talk about that simply saying, “we'll see,” when the U.S. Attorney was questioned outside the courthouse. 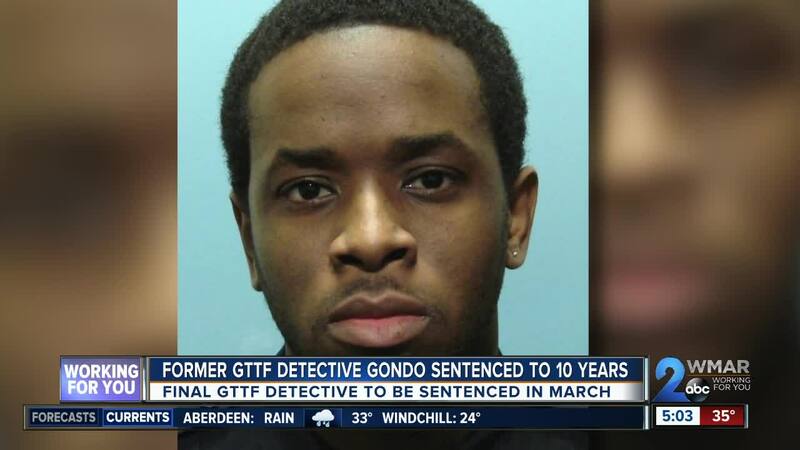 But the feds asked for 10 years for Gondo, well below the sentencing guidelines for this kind of crime. Still, U.S. Attorney Robert Hur said, it is a just punishment when everything is considered. "They were very, very serious crimes and as Mr. Wise said properly, they really tore at the fabric of relationships between the Baltimore Police Department and the city of Baltimore's citizens. But we do have to weigh what Mr. Gondo did after he was charged and what he did to assist the government investigation." And so that leaves Jemell Rayam as the final GTTF member to be sentenced. He too cooperated with the feds and testified in last year's trials. Rayam’s sentencing was just scheduled today and is now set for March 8th.